“Draw right! Forward! Left! 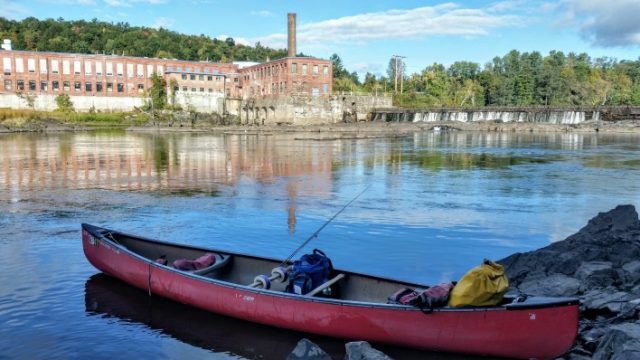 Nice, we made it!” These calls emanated from our canoe as we navigated our way down one of a number of fast-water reaches of the Connecticut River. Overhead, multiple bald eagles could be seen soaring in circles, searching for fish. 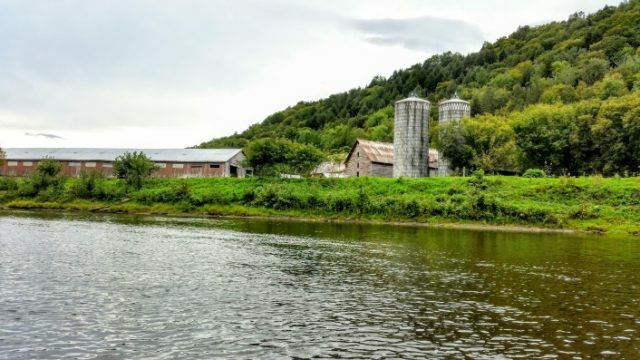 Behind us, a classic New England covered bridge disappeared around a river bend. In front of us, kingfishers flitted about amongst the silver maples and white pines lining the riverbank. 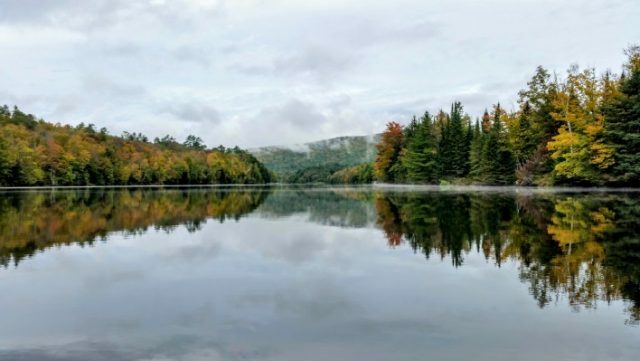 Below us, the stretch of bumpy water slowed into a clear, glassy, winding flow, pushing our boat along at a relaxing pace as it reflected the fall foliage upon its surface. 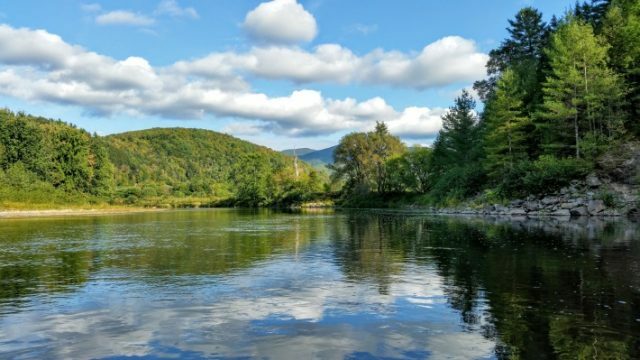 This majestic river has its headwaters at the border of Canada, and forms the entire border between Vermont and New Hampshire. 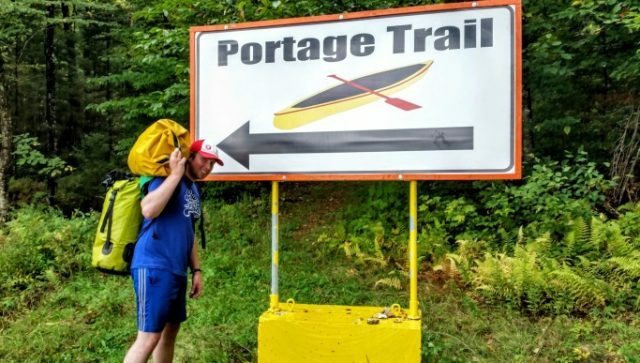 During the last week of September, I had the pleasure of paddling down its northern stretches. Accompanied by an old college friend, I was scouting this section of water as a potential Four Trails route. Specifically, I am looking at creating an additional offering for Adventurer campers besides the standard hike/bike combo*. The exact details of this trip are still in the works, but what I can say is that I was thoroughly impressed by this river, and the vast potential it holds for creating a rewarding adventure. In fact, I am still in awe of all the beauty hidden in this valley, a beauty that only reveals itself to those who are willing to explore down its length. Let me explain exactly what I mean by this. First off, there is the plentiful wildlife. 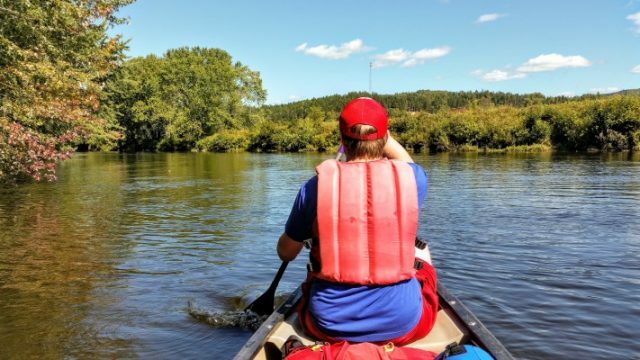 Over the seven days on the river, we saw more bald eagles than people, countless great blue herons and kingfishers, merganser ducks, Canada geese, ospreys, bear, coyote, swimming squirrels, beaver, and signs of otters, muskrats, deer, moose, and raccoons. Then there is the water itself. Class I rapids and “fast-water” are interspersed between sections of calm water. 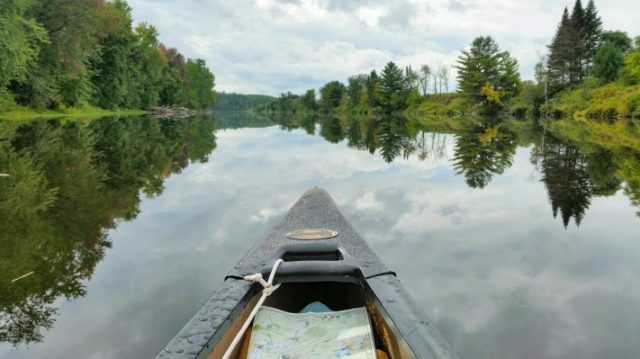 The faster water provides incentive to master the steering paddle strokes, as it provides a wonderful sense of accomplishment in a canoe for beginners and experts alike. If you are unlucky and hit a rock, the consequences are low but you might get a little wet! In the calm water stretches, the current usually still provides a noticeable boost, providing opportunities for either covering many miles in a day, or relaxing for a bit and watching the landscape drift by. A few dams also offer the opportunity for portaging! 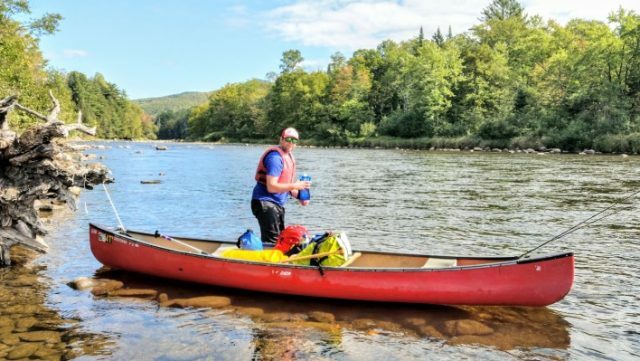 While some might wince at the thought of carrying boats and packs over land, during a river trip it is almost always a welcome relief from sitting. 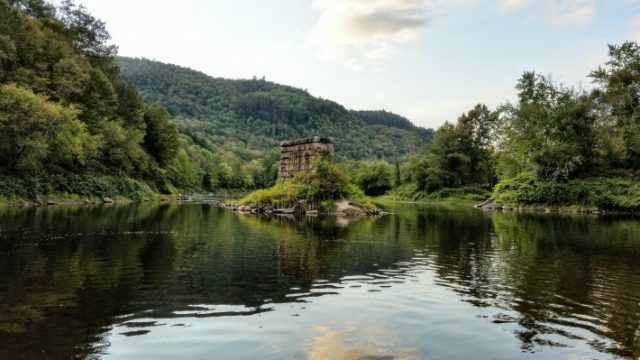 The Connecticut River includes a handful of portages, each trail no more than half a mile, all of which provide opportunities for physical and team challenge. I mean, how often do you get the opportunity to carry an 80lb boat on your shoulders through the woods?! Lastly, there is the cultural component to the river. This is not a backcountry river, and definitely not wilderness. Farms, fields, bridges, roads, towns, and other boaters are all daily occurrences. While natural beauty is plentiful, I found that the human impacts equally added to the experience. 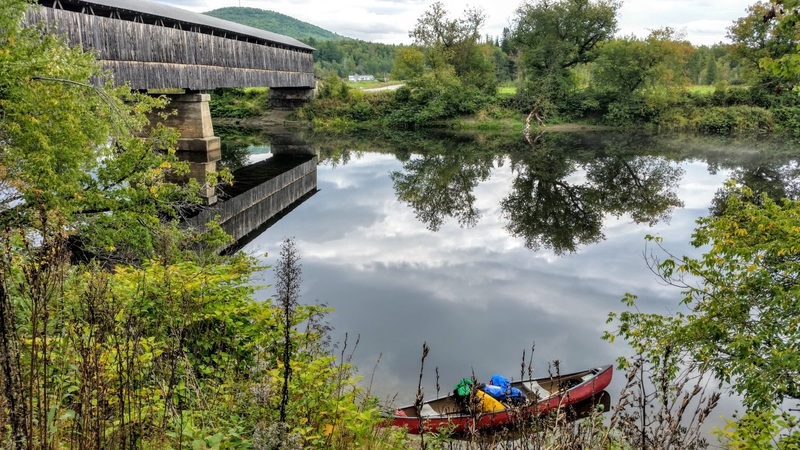 I felt as if I was discovering a new perspective on the communities of northern New England, and seeing firsthand the ways in which these communities interact and depend upon this river. In some instances, there are signs of how this river has influenced human life over the course of many centuries. 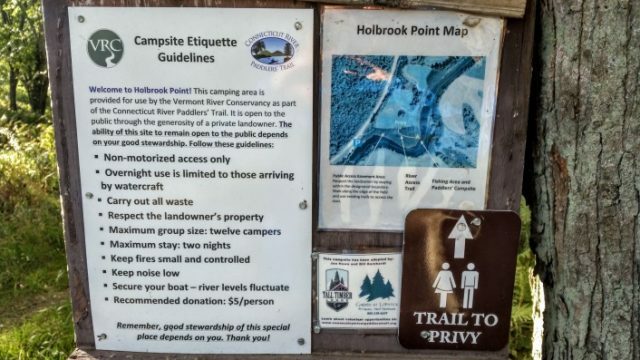 Furthermore, the campsites, access points, and portage trails are well-maintained by a network of trusts, conservancy groups, and volunteers that make this route possible. With picnic tables, privies, and riverside tent spots, many of the boat-access-only campsites have a luxurious yet secluded atmosphere! 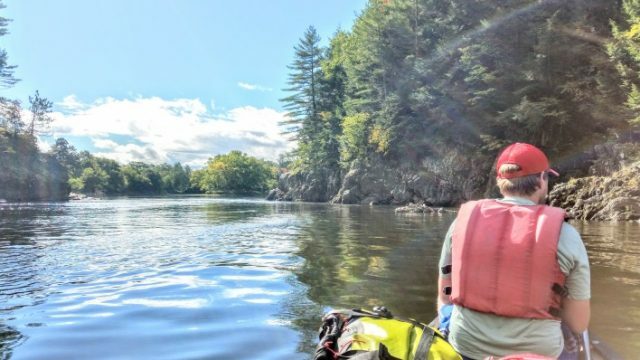 I could go on and on about the joys of this river paddling trip, but I also want to allow the photos to speak for themselves. Hopefully, a number of you will get to experience it as well in future summers! 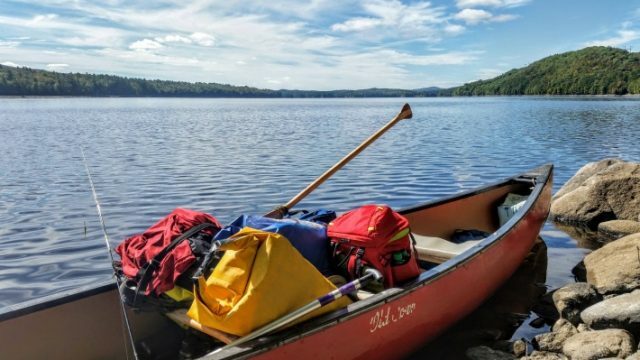 *Please note for everyone registering for the Adventurer program for the summer of 2019, you do not have to make a decision between hike/bike and canoe/bike upon registration (instead, you will simply register for “Adventurer”). Later this winter, I will be in touch regarding preferences for either trip. We understand that a number of factors go into these preferences, including friendships from past villages, and we want to be able to take this all into account when forming the trips! As always, please contact me (nsmeltzer@ayf.com) with any questions.